For many years asbestos was a common ingredient in masonry cement and other concrete and cement products. Unfortunately, the United States is one of very few major industrialized nations that has not banned asbestos entirely in all of its forms. It continues to be used in gaskets, friction products, roofing materials, fireproofing materials and other products that are used every single day. Iceland was the first country to ban all types of asbestos in 1983. Asbestos-related diseases are caused by inhalation of dust from asbestos divers. The scary thing about asbestos is that the fibers are so small, you can’t see them. Although throughout life, many people come into contact with this mineral fiber – as a result of living in an industrial city, most of the cases come from professional backgrounds. This is why you need to have a realistic approach to all aspects of asbestos by hiring accredited professionals to handle asbestos-containing material. Many of the products manufactured today do not contain asbestos. Those few products that still contain it are mandatory to be labeled in this sense. However, many of the building materials used at home contain asbestos. The term “masonry cement” refers to a specific type of cement that contains additives that increase the cement’s binding strength. Although unsuitable for use with concrete blocks, masonry cement is very useful in the construction of walls using brick, cinder block, and stone. 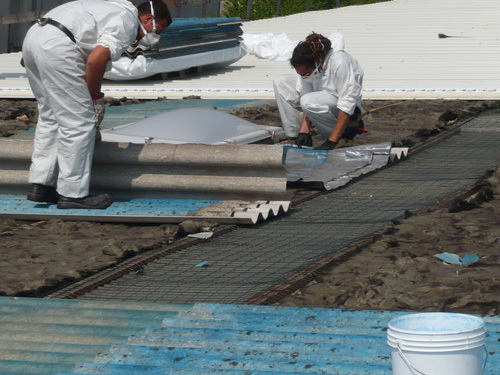 For many years, asbestos was a common ingredient in masonry cement and other concrete and cement products because it was inexpensive, easy to use and provided a great deal of tensile strength and heat resistance to the finished product. Over 95% of the asbestos fiber used in this manner was of the “white” variety, also known as chrysotile asbestos. It is less harmful than other types of asbestos, but can still cause serious respiratory problems. Masons and bricklayers are among those construction workers at high risk for asbestos exposure from masonry cement, as are demolition workers whose duties require handling of old fire brick and similar materials. Steam pipes, boilers and bins isolated with an asbestos coating or asbestos paper tape. These materials can emit fiber if they are damaged, repaired or removed inappropriately. Elastic flooring (asbestos, asphalt and rubber), vinyl coating and adhesives used for tile mounting. Polishing the tiles might emit fiber. Just like polishing or grinding the floor during removal. Cement layer, asbestos board and paper used as insulation around furnaces and baskets. The repair or removal of installations could emit asbestos fibers. Just like cutting, grinding, polishing, drilling or cutting insulation. Sound insulation or decorative materials sprayed on walls and ceilings. Poor, broken or flooded materials could emit fiber. So also their polishing, drilling and crumbling. Carpentry and jointing compounds for walls and ceilings and textured paints. Polishing, scraping or drilling these surfaces could emit asbestos fibers. Many of the old household products such as fire resistant gloves, stove roofs, irons or hair dryers. Brake pads, clutch plate and car gaskets. Mesothelioma is a type of cancer that primarily affects the outer lining of the lungs (called pleura), although it may also appear to other parts of the body, such as the peritoneum, which is the mucous membrane of the abdominal cavity. Disease can occur even at very short exposure to asbestos. In some cases, symptoms may occur up to 50 years after exposure. In the case of mesothelioma, patients suffer from lack of air, weight loss, fatigue, chest and back pain and jaundice (yellowing of the eyes and skin) when associated with the lungs and also swelling of the abdomen when it affects the peritoneum. Diagnostic can be made after a radiogram or computed tomography. Sometimes a biopsy is required. It is the worst asbestos-related disease and there is no treatment yet. Unlike mesothelioma, lung cancer has several causes. The most common is smoking, but exposure to large amounts of asbestos may be another cause. Symptoms of lung cancer include difficulty of breathing, chronic infections, coughing with blood, pain and weight loss. Treatments are available in the form of chemotherapy, radiotherapy and surgery. Asbestosis is a pulmonary fiber, being defined as a condition triggered by the exposure to asbestos. Symptoms include difficulty of breathing, chronic cough and fatigue. Asbestosis is a progressive disease that leads to the development of a respiratory disability. This is another asbestos-related condition; the thickening of the lung wall happens due to scars caused by asbestos fibers. It usually does not endanger life, but it can lead to significant respiratory issues. Often, the thickening of the pleura may be a sign of increased risk of developing a more serious disease in the future. These are small areas of fibrosis or scars on lung tissue caused by long-term exposure to asbestos. The disease itself is usually benign, but studies show that about one out of seven people affected by pleural plaques will develop mesothelioma, the aggressive form of cancer detailed above. Amorphous silica fabric: does not rot, attract mildew or burn. These fabrics are heat resistant, used for high-temperature insulation, application protection and thermal protection. Thermoset plastic flour: finely ground wood flour mixed with binders, like egg or gelatin, hardened and finely ground. Once heated, it retains its chemical composition. Efficient, cost-effective, well-suited for prime temperatures and used as associate adhesive. Flour fillers: using natural resources to form a filler for cracks and crevices, aiding natural insulation. These materials may include pecan shell flour, rice hull ash, rice flour and wheat flour. Cellulose fibers: one of the most popular alternatives, made from finely shredded newsprint and chemically treated to increase resistance. It is also generally made of 5 percent recycled content, which makes it a viable green alternative. Anti-asbestos advocates and health specialists fight every day to ban asbestos worldwide. Since 2005, the World Health Organization has fought to combat the growing number of mesothelioma cases. In 2013, they introduced a global action plan aiming to end asbestos use in the organization’s 190 nations and states by 2020. John Stuart is a freelance writer. He can be reached at johnstuart@creare-marketing.co.uk.